What is a Custom Light Show? The winter season inspires a lot of anticipation. For many, the holiday season begins, as fall draws to a close. Thanksgiving, Christmas, Hanukkah, and many other holidays are all celebrated during the end of fall and the winter. During these holidays, presents, food, and drinks are shared between friends and family, which makes this time feel comfortable and cohesive. However, the fall and winter seasons aren’t always about stuffing your face and purchasing gifts for loved ones, the holiday branches to other meaningful experiences as well. For instance, the holidays are mostly religious holidays, in which you and your family can gather in your faith and celebrate your beliefs. The holiday season also gives way to extreme decoration displays and special events. For the holiday, custom light shows are by far one of the most common traditions in America. Light shows are not only exciting to observe, but they can fill the air of a neighborhood or community with a greater sense of holiday cheer. Custom light shows aren’t just for holiday festivities. At Rythm EFX, we are able to provide residents in the Denver area with premier light displays. Below are some examples of some custom light shows that Rythm EFX offers our customers. Have you ever been to a concert without any special effects or light shows? Us either. Extra effects add to the musical experience of any genre. No matter whether you are going to major recording artist’s concert or even to the small gig of a local band, lighting can always make the watch-experience that much more special. At Rythm EFX, we are able to provide you with special effects shows, as well as lighting sequences. What makes custom light shows so advantageous to music performances is that the special effects can be coordinated to go off during bass drops or monumental moments during your concert. The special effects will not only amplify the experience of the song, but the performance as a whole. Ignite the excitement of your audience by coordinating custom light shows with your performance. What is the best way to improve the experience of your birthday, anniversary, or even wedding — custom light shows! Having a custom light shows can add an extra effect to your party, that other activities or effects cannot. For instance, you might have special activities at your party, but nothing will be as memorable as a thumping dance floor and a spectacular light show. Fashion shows depend on lights to help move the event along. Lights are used as cues for models, as well as fashion designers. Light shows are also a great way to entertain the audience members during the fashion show and outfit changes. Fashion shows can also rent out strobe light shows for their event to add to the aesthetic drama of the show. Rythm EFX is able to provide light shows for many different events, such as local Colorado fashion shows. As stated earlier in this blog, holiday light displays are very common during the winter. 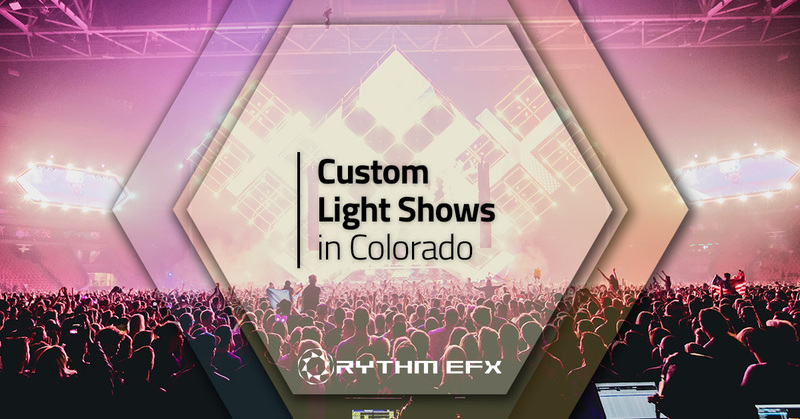 Rythm EFX has had the pleasure of coordinating many different holiday light shows all over the state of Colorado. In 2017, we had the pleasure of arranging the holiday light display for Winter Wonderlights in Loveland, Colorado. For holiday light shows, the light performances can be large and complicated. Rythm EFX is able to provide spectacular light shows, ranging in all levels of magnitude. If you have a custom lighting plan, contact us today to discuss your ideas. We are excited to hear them! Rythm EFX is a custom lighting company that has been involved in the special effect industry for more than a decade. Among our talented crew, we have artists, lighting experts, and special effect technicians. No matter what you would like for your custom lighting show, Rythm EFX can deliver a truly stunning light show. Contact us today if you are interested in our special effects services.